I came to realize that I simply had way too much lead left in my pencil to idle my days away. This led Ken on a journey of researching and investigating entrepreneurial opportunities that fit his passion and excitement. Every opportunity explored drove him closer to the fitness industry, plus Ken and his family have been long-time members at TITLE Boxing Club. I’ve come to view TITLE Boxing Club similarly to the way Starbucks views themselves as someone’s “3rd place” between work and home. TITLE Boxing Club isn’t simply about burning calories and working out. It’s about the experience and lifestyle. His three daughters also worked at TITLE Boxing Club in a front-of-store position while attending school. His youngest daughter actively competed in many USA Boxing tournaments, winning several national titles. After becoming a TITLE Boxing Club member, Ken lost 40 pounds and increased his cardiovascular fitness. He also volunteered as a certified USA Boxing Official and coach. Feeling very passionate about his experience, Ken wanted to help other people change their lives in a fun and exhilarating way. Since TITLE Boxing Club was his 3rd place, it seemed natural to set his sights on opening a club here in Frisco. Last June, that happened when Ken opened his own location conveniently located off Preston and the Sam Rayburn Tollway. The club is easily accessible for everyone in the four corners – Plano, Frisco, Allen and McKinney. Ken has watched several of his members change their lives, too. 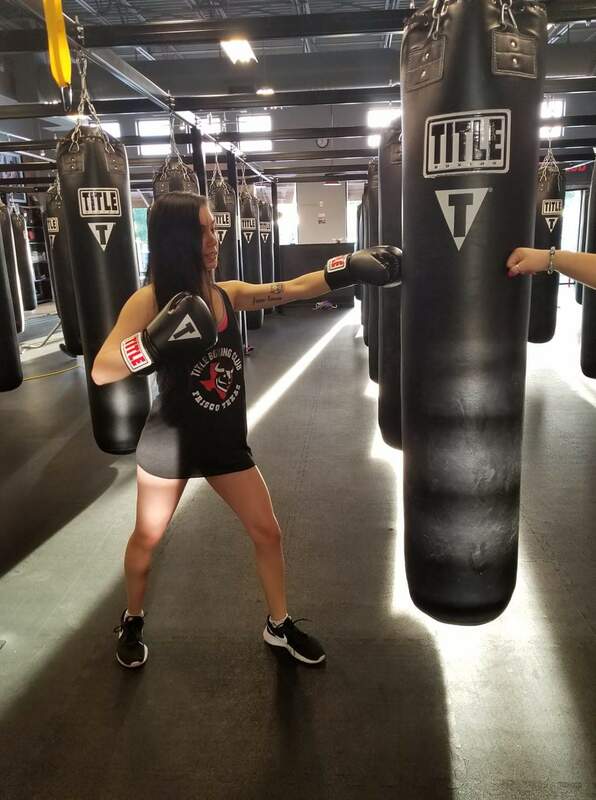 Others love the club because the workouts never get boring; the trainers are actively engaged; and the members are able to see amazing health benefits reaped from regular boxing sessions. Move over Gentlemen… Ladies love Boxing too! Boxing hasn’t always been on women’s radars. However, now that organizations such as TITLE Boxing Club have arrived, the women are participating. I love TITLE Boxing Club in Frisco for many reasons. First and foremost are the workouts. They are intense but work for all levels. I never get bored like I would if I was trying to get a cardio workout on a machine in the gym. The trainers are phenomenal! They challenge you without being obnoxious or in your face. You truly get out of it what you put into the workout. In the case of personal trainers, at a point they become boring and mundane. That’s not the case with TITLE Boxing Club. You get a full body workout that builds muscle and increases your strength and stamina. The classes are fast-paced and fun. And the trainers are amazing! They each bring their own knowledge and personalities to each class. You form friendships with your “boxing buddies” and look forward to each and every class. I have to say that it’s the most challenging and fun workout I’ve ever had. Boxing is one of the most physically demanding sports on the body. The intensity, fast pace, and short rest periods improve the cardiovascular system. The sport also improves blood flow enabling the body to recover quicker from physical exertion. And don’t forget about confidence you gain in being able to “handle” yourself if needed… How exhilarating! If you’re nervous about starting to box with no experience, consider trying out a TITLE Boxing class on the house. The first one is on Ken! You might consider stopping by the club on June 23rd, from 9:00 a.m. – 2:30 pm as Ken is opening his club up to the community to celebrate their 1 year anniversary. It’s a great way to meet their phenomenal trainers, check out the club, and learn about new promos. The club also features Joe Castillo, one of the first trainers in the state of Texas for TITLE Boxing Club. You may have heard him on the radio ‘The Joe Show.” If you can’t make the event, make sure talk to Ken, Joe, and the other trainers in their booth at Frisco Freedom Fest on Wednesday, July 4th. By regularly showing up at TITLE Boxing and following a nutritious eating plan, there’s no reason you won’t see changes in your shape and improvements to your fat mass percentage. Plus, if you’re hoping for a pat on the back from your bathroom scale, you’re likely to see changes in your weight as well!